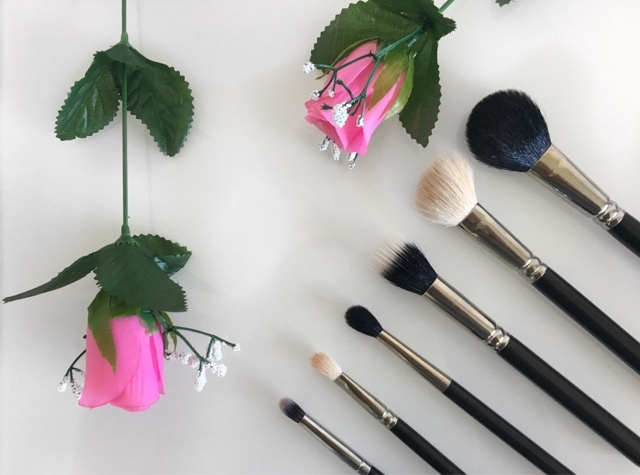 When it comes to good makeup, good brushes are just as imporant as the products you use. I've used many different brushes over the years and whilst I've discovered new brushes, I've got a few which are my favourites. My top four face brushes are (from left to right) the MAC 129, MAC 168, MAC 188 and the Real Techniques Setting Brush. 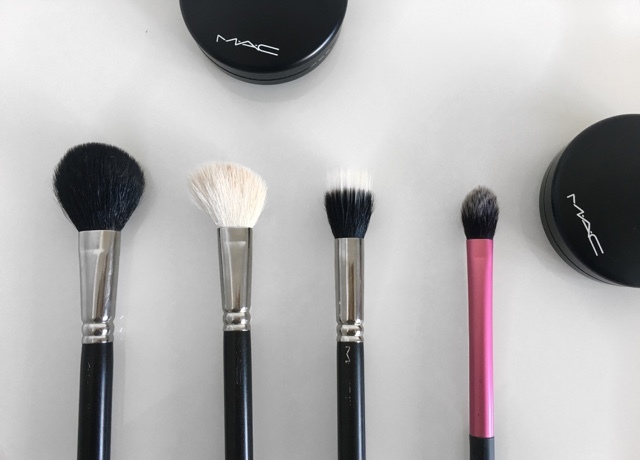 MAC 129 is the brush I use to set my foundation with powder after I've used my loose powder to set my concealer (for more details here's my How To: Flawless Base post). I love this brush because it's the perfect size and it's pinched at the base so it's not perfectly round. The only problem I have is that sometimes the bristles on the brush shed, but this doesn't happen too often but it can be quite annoying trying to remove a bristle stuck to your foundation it's enough to drive a gal crazy on a Monday morning. Whenever I wash this brush I find that if I don't apply conditioner to it and let it soak it in for a while before rinsing, the bristles can be quite harsh. MAC 168 is the brush that I use to apply my contour, bronzer and blusher. The bristles are natural hairs which means that my powder products blend out seemlessly. I love that this brush is angled as it allows me to easily sculpt underneath my cheekbone. The angled brush also makes it easier to sweep blusher across the apples of my cheeks. MAC 188 is a new recent favourite of mine. I have two of these brushes and I use one for foundation and one for highlight (this is a very versatile brush). Because this brush is a duofibre brush it blends out my foundation flawlessly and it's also great for applying highlight to the tops of the cheekbones too (not after it's had foundation on obviously). Real Techniques Setting Brush is a brush I've had for a very long time, just over two years I think and it's still going strong. I used this for a long time as a highlighter brush but when "baking" became more popular I now use it to apply loose powder underneath my eyes to set my concealer as it's small so it's the perfect shape to fit underneath my eyes. I have 6 eye brushes which are my absolute favourites (from left to right) MAC 224, MAC 217, Real Techniques domed shadow brush, Morphe E17, Anastasia Beverly Hills 12 brow brush, MAC 210. MAC 224 is my little baby, I would be seriously lost without this brush. Because this brush has natural bristles it's perfect for blending eyeshadow. I use it to blend my transition colours and I also use it for nose contouring as well. The bristles on this brush are the same as the MAC 129 so again when I've washed the brush I condition it, this also makes the bristles softer on the skin around my eyes when I'm blending as this is thinest skin on the body. MAC 217 is the blending brush I use after blending my transition colour into my crease using the 224, the 217 is smaller so it really helps to sculpt out the crease and create the illusion of a really deep socket. Real Techniques Domed Shadow Brush is the brush I use to apply and blend my eyeshadow primer, the brush has synthetic bristles so it's great for blending out cream products like eyeshadow primers. This brush is similar to the Real Techniques crease brush but this one is pinched at the bottom which makes it easier to pack on the primer. Morphe E17 is a brush which I use to apply eyeshadow to my lower lashline. Before this brush I used a pencil brush but it didn't blend the eyeshadow low enough underneath my eye and didnt blend seemlessly enough. Because this brush is fluffier it makes it so much easier to blend eyeshadow underneath my eyes. Anastasia Beverly Hills 12 Brow Brush I don't know what on earth I was doing before this brow brush. I purchased it when I ordered my first Dipbrow and I've never looked back. The brow brush is so thin and stiff that it makes defined brows easy to do and because it's so thin it makes it super easy to make the brow have a thin taper at the end. MAC 210 is my favourite eyeliner brush because it's so thin. This brush makes eyeliner so easy because you don't have to worry about making the line too thick straight away. This brush also makes it very easy to do winged eyeliner because the brush is so fine. Those are my favourite all time brushes! 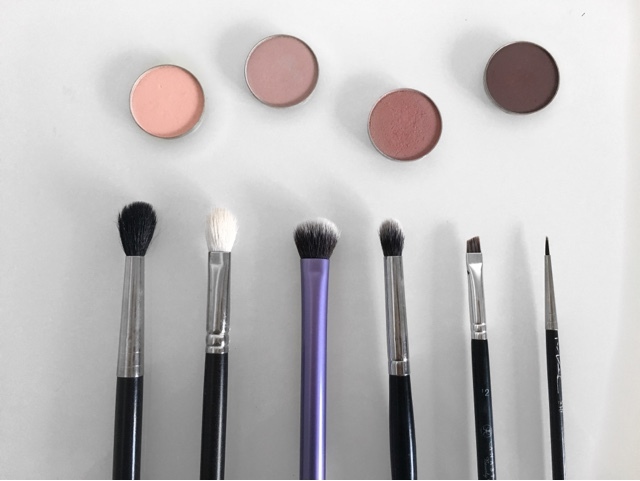 Let me know what your favourite brushes are and why you love them in the comments! See you soon!